Tired, dented, in need of some TLC, but keeps running and much loved. 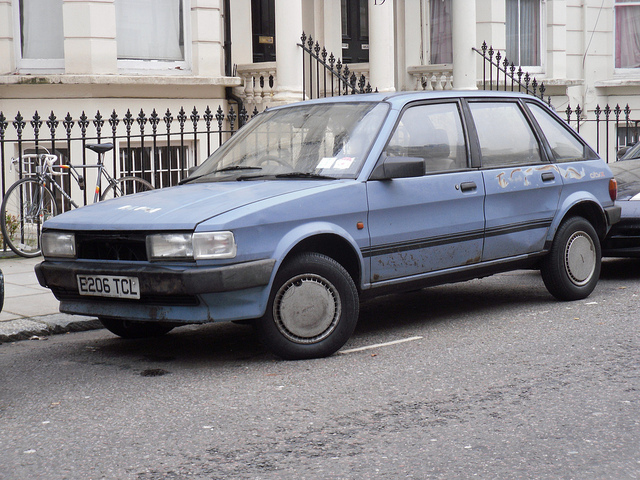 I had an Austin Maestro once, not the one pictured but the same colour and condition, it never really let me down, just frustrated me somewhat with it's lack of power and occasional backfiring. I gave it away in the end. If the Charlton team resemble the running, the pitch certainly resembles the bodywork. 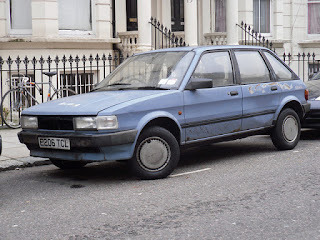 The Valley yesterday was graced with an Austin Maestro. Not parked on the touchline in the way the good old fashioned Invacar used to grace football stadiums in the seventies, no this one was screaming it's way into the net in front of the Jimmy Seed stand. Charlie Austin was the scorer, the goal a masterclass in sublime finishing. Prior to yesterday Burnley had gone three games without scoring, these runs do tend to have a habit of finishing against The Addicks. The goal itself came out of nowhere, at a time when most were thinking of half time after a bit of a slow and tedious first forty five minutes. Those trying to beat the toilet queues missed a peach of a strike from some distance that would have beaten the best of keepers. Austin was a revolution at Swindon, I always thought Burnley had got themselves a real capture when he signed just over two years ago. He's averaged a goal every other game for The Clarets ever since! Burnley seemed happy to sit back on their single goal advantage during the second period, but save for a late flurry with Morrison and then Cort staying forward and leading the line, Charlton continued to frustrate the home supporters. With two months remaining, you'd be forgiven for thinking Charlton already had an air of 'end of season' about them. The home form (the worst in the division) has in effect killed off any slim hopes of a play-off challenge, if it wasn't for the worrying fact that the sides occupying the lower reaches of The Championship all seem to be picking up points, our season really would be all over now. We hark on about survival being the be all and end all of the campaign, but it would be lovely to finish with something to cheer, even another home victory would do. I thought (hoped) that our blueprinted last third of the season slump was something now consigned to the history books. Chris Powell was brave with his team selection, Ben Hamer dropped to make way for David Button to make his league debut. With Solly and Stephens injured, and Kermorgant beginning his suspension, the starting eleven had a very different feel to it. Jon Obika got his first start and there was even places on the bench for the returning Andy Hughes and young Callum Harriott. Chris Powell could pick a team of high flying international superstars and I think they'd struggle to get a result, they'd certainly leave the pitch to a barrage of frustration from the boo boys. I don't really believe the booing helps, it's not as if the players aren't giving their all, things just don't seem to be going our way. I can understand that supporters paying for tickets are annoyed and disappointed wanting to see their team win, but it's a touchy subject and I don't feel the boos are always aimed at anyone in particular, just a way to vent their irritation. Whether you agree with it or not, we have free speech and booing falls into that bracket. If you've paid for your ticket you're allowed to voice your opinion (within reason and common decency), for the moment anyway. The way modern football is going, that too may disappear sooner rather than later! The bottom line is that at this level we fall short, money needs to be spent during the summer (if we have any) otherwise all the hard work put in by Powell and co will be in vain. I dread to think what would happen to the club if the unimaginable happened and we found ourselves back down in the third tier. Fortunately for us our next two fixtures are on the road so we have a chance to add to the points tally, albeit starting against a very in form Peterborough United on Tuesday evening.